Get Your Groove On at Pints for Pups! Reading, PA—Pints for Pups is the original dog and family-friendly beer festival that brings in more than 500 people annually and features infinite samples of beer, delicious food, and mind-blowing music on Saturday, July 22 from 5-8 PM at Jim Dietrich Park. As one of Humane Pennsylvania’s most popular fundraisers, all proceeds directly benefit lifesaving programs provided by The Humane Society of Berks County and The Humane League of Lancaster County! 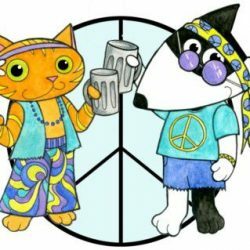 This year’s Pints for Pups is flowing with a 60s throwback theme that will have patrons dusting off their bell bottoms and peasant blouses! The scenic trails of the Schuylkill River set the stage for the ultimate Woodstock reincarnation event, showcasing a far-out concert by Kiss The Sky – The Jimi Hendrix RE-Experience, the #1 Hendrix act in the world! It’s a historically accurate sight and sound performance whose lead singer and left-handed guitar virtuoso Jimy Bleu emulates Jimi Hendrix’s signature moves so well, he’s been a touring member with Billy Cox – Hendrix’s bassist – and his band, Gypsy’s Experience. Kiss The Sky has had the honor of performing with and endorsement of all living members of Jimi Hendrix’s own bands. In November of 2016, the band was chosen to play a live television concert on the AXS-TV network broadcast to 48 million households. No doubt the rock legend himself would approve! Patrons are invited to fill and refill their commemorative Pints glasses with more than 75 different brews provided by local and regional breweries. Aulenbach Wines will also be in tow with an exclusive wine pouring and wine slushy sales. Guests can explore a number of vendors between sips and when the munchies kick in, they can fill their plates from a buffet of outtasight picnic fare catered by Mayo’s Classic Catering. As the sun shines down on Pints, guests and their canine companions can cool off by dipping their paws along the river’s edge. Don’t settle for flat; get the full-bodied Pints experience as a VIP (Very Important Pinter). VIPs receive early admission at 4 PM, access to exclusive beer samples, a Pints t-shirt and preferred parking. VIP tickets are $75 each (advance purchase only). General admission tickets are $40 ($50 at the door), Designated Driver tickets are $20 and Junior Pinter tickets are $10 for kids under 21 attending with family. All ticket holders except Junior Pinters will receive a Pints for Pups collector’s glass for keeps! Purchase tickets now at humanepa.org.